The herpes test measures herpes 1 and 2 blood antibody levels. What is the herpes test? The herpes test measures herpes simplex types I (HSV-1) and II (HSV-2) IgG blood antibody levels. Why is a herpes test important? Herpes is an infection that can cause painful symptoms and can be transmitted to other people through sexual contact. This Herpes Test is a blood test. This herpes test, sometimes known as a herpes blood test panel, measures herpes virus 1 and 2 IgG antibody blood levels. Herpes, or herpes simplex, is a disease caused by a virus known as the herpes simplex virus. Herpes is transmitted through contact with body fluids of someone with a herpes infection and, in many cases, this occurs through sexual activity. The most common types of herpes viruses are herpes virus type 1 (HSV-1) and herpes virus type 2 (HSV-2). While the viruses can be tested independently through the HSV-1 test and the HSV-2 test, they are frequently tested together for broader coverage. Generally speaking, HSV-1 causes oral herpes infections while HSV-2 causes genital herpes infections. However, ordering both herpes tests at the same time is also beneficial as HSV-2 can cause oral herpes and vice versa. People who want to test for herpes and other common sexually transmitted infections should consider the STD test panel. Most healthy people will not have any major complications for a herpes simplex virus infection. After the symptoms are present for a period of time, they often go away spontaneously. Populations at risk for complications from a herpes infection include very young children, the elderly, and people with compromised immune systems. Complications from a herpes infection include infections affecting the eyes, nervous system, and genital tracts. Oral herpes infections are characterized by cold sores around the mouth or lips which look like clusters of blisters. Occasionally, no blisters will be present but some throat pain might be present. Genital herpes also manifests as blisters around the genital areas which occasionally form ulcers that can be painful. Historically, it was thought that someone was considered capable of infecting others only when they had blisters but now it is believed that someone can transmit the infection even without active symptoms (asymptomatic shedding). When symptoms are present, they typically start four days after an exposure and can last for several weeks. HSV-1 may also be involved in causing a condition called Bell's palsy but there is no clear, strong evidence in that regard. Getting a herpes test near you is usually a relatively straightforward task if you have a lab in your area. Most lab locations carry the necessary equipment to perform the herpes virus blood test. Once you get your blood drawn, lab results come back relatively quickly (typically four business days but sometimes much sooner, depending on the lab location). Herpes IgG blood testing is thought to be 98% specific at identifying and discriminating HSV-1 and HSV-2. In the setting of a herpes virus infection, this herpes test is typically positive approximately 25 days after the exposure. A herpes test can be positive and identify an infection even in the absence of symptoms. Interpreting a herpes blood test lab result is not an overly complex process. 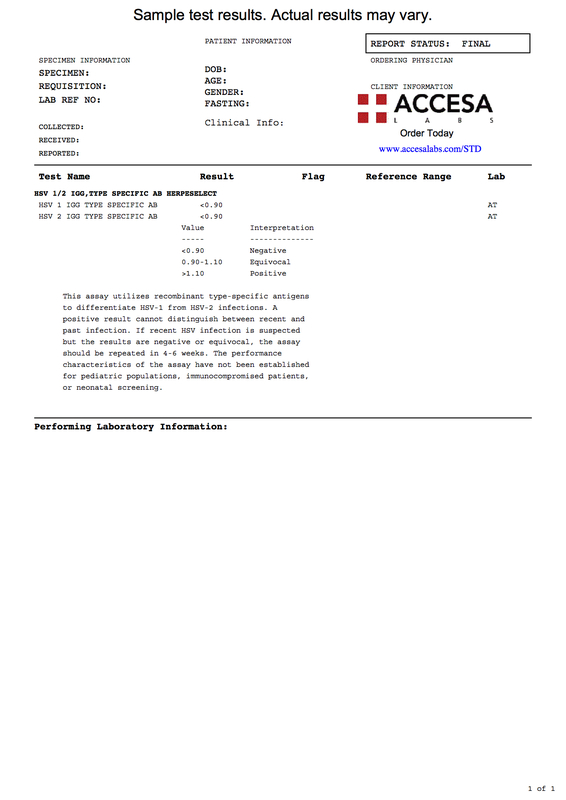 In the herpes sample lab report we have provided in the link above, the IgG Type Specific Ab levels are <0.90 for both HSV 1 and HSV 2. Per the reference range provided by the laboratory, a result <0.90 indicates a negative test result. As noted by the other reference ranges, >1.10 is considered a positive herpes result while 0.90-1.10 is considered equivocal. Unfortunately, equivocal results are indeterminate and repeat herpes testing is usually warranted. While herpes blood testing is accurate, the lab results can be negative even when a herpes infection is present (i.e. false negative lab result). There are several reasons why this may happen. In most cases, the reason that a herpes lab result came back as a false negative is because the testing was performed too early after the herpes exposure. In these cases, it is not so much that the herpes test was wrong but rather the test was not sensitive enough to detect herpes in the blood at this early of a stage. Other reasons why a herpes lab result might come back as a false negative is if one's immune system is so compromised that an adequate herpes IgG antibody response cannot be generated (rare). While our herpes test requires a visit to a lab, our testing process is private and no information is shared with your health insurance company or your personal doctor without your consent. That being said, some people would prefer to get a home herpes test (i.e. mail order). While there are some herpes test kits available on the market, current data suggests that they may not be as accurate as the FDA-approved herpes blood testing labs that we use and are trusted by doctors and medical providers across the country. In order to prevent exposure to herpes, one must avoid any oral or sexual contact with an infected person. While condoms might help during sexual activity, they are by no means foolproof in preventing transmission of the herpes virus. Once infected, there is no cure for herpes. During periods of active symptoms like blisters, specific antiviral medications can sometimes reduce the duration of the symptoms and intensity of any associated pain. The CDC estimates that 776,000 people get new herpes infections each year and that 15.7% of people between the ages of 14 and 49 have an HSV-2 infection. For anyone concerned about a herpes exposure or for people in a new relationship, herpes lab testing is a helpful way to determine your status with simple, affordable blood testing. Herpes Test at Guaranteed Prices.